The Young Scientist Awards is the premier curriculum based STEM initiative that encourages and inspires inquiry-based learning in Science, Technology, Engineering Studies and Maths classes across New South Wales. Since 2016 the respective professional teacher associations that represent STEM education in NSW have collaborated together with the common purpose of building a better Australia by engaging students in the whole Science, Technology, Engineering and Mathematics (STEM) Enterprise. The STANSW Young Scientist Awards feature the categories Working Scientifically, Working Technologically and Working Mathematically. 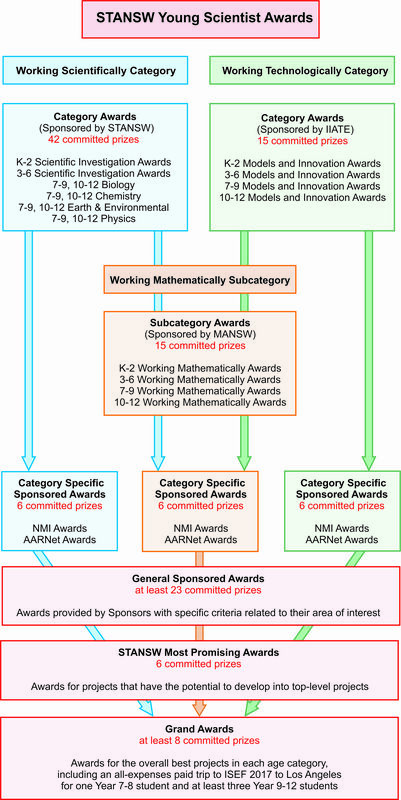 The number of committed prizes have also dramatically increased from 86 in 2015 to at least 150 in 2018 (see diagram below). Students will STILL be required to conduct a scientific investigation and/or design and build a model of an innovative device or application. For the Science Teachers’ Association of New South Wales Inc‘s “STANSW Scientific Investigation Awards”, projects will be assessed on the level of Working Scientifically outcomes that have been achieved. For the Institute of Industrial Arts Technology Education‘s “IIATE Models and Innovation Awards”, or the OSHClub‘s “OSHClub Inventions and Innovation Awards”, projects will be assessed on the level of the Working Technologically outcomes that have been achieved. For the Mathematical Association of NSW Inc‘s “MANSW Working Mathematically Awards”, projects will be assessed on the extent that the investigation or innovation incorporates the interrelated components of Working Mathematically. STANSW, IIATE and MANSW are all keen to be involved in this major STEM initiative and are desirous that students get involved in a project that achieves outcomes across each Working Scientifically, Working Technologically & Working Mathematically strand.